Only a UPS with the highest possible efficiency rating could take its place among the equipment installed in a brand new data center constructed around energy conservation. 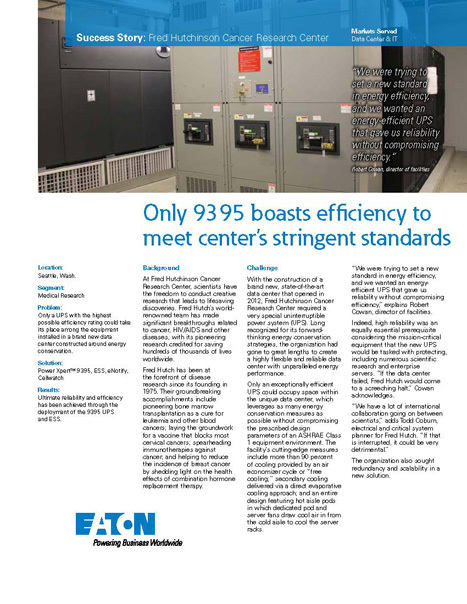 Ultimate reliability and efficiency has been achieved through the deployment of the 9395 UPS and ESS. With the construction of a brand new, state-of-the-art data center that opened in 2012, the cancer research center required a very special UPS that delivered energy-efficiency and reliability without comprimising efficiency. Fred Hutchinson Cancer Research Center deployed the 9395 in its data center to answer the call for high reliability, availability and efficiency.